The MVP award, Most Valuable Player, goes to the best in the NBA season. But shouldn’t it be going to the player which means the most to his team? Is that even something that’s measurable? In a way, and if going in that direction, no one is more important to their teams this season than Anthony Davis (New Orleans Pelicans) and James Harden (Houston Rockets). Redditor pleasefeedthedino used a pretty simple but effective method to see which teams get carried by a single player. 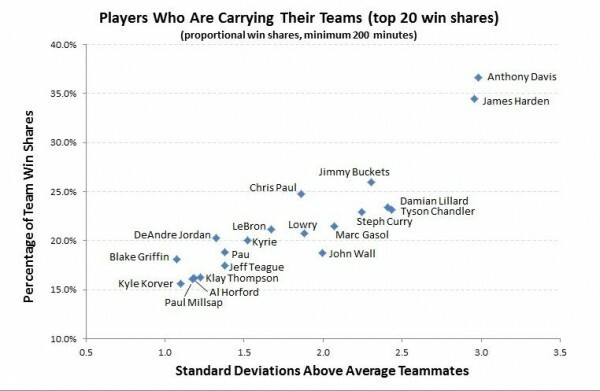 Anthony Davis and Harden are far ahead of the rest of the league, but that doesn’t necessarily mean it’s good for their teams. 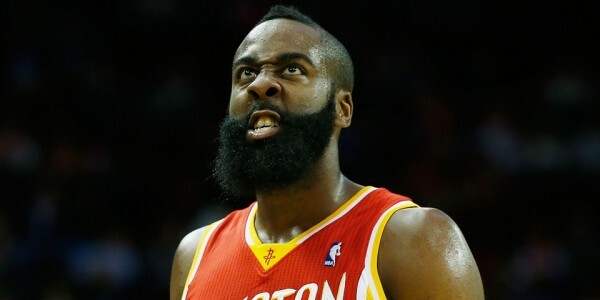 Once might say that Harden, probably the leading MVP candidate thus far, is doing well on a championship contender, but Davis is playing for a team hovering around .500 and might not make the playoffs. A big hi-5 to the teams that are the best in the league so far is shown here. The Atlanta Hawks have four players in the top 20, all around the same position on the chart, which goes to show how well the “love” is being spread there. Klay Thompson is trailing Stephen Curry, but he’s not too far behind. It means that being the best in the league has nothing to do with having the absolute best player, but more about playing smart, mostly unselfish basketball. It’s surprising to see the Clippers, who are slightly underachieving so far this season with three players in the top 20. The Bulls with Jimmy Butler and Pau Gasol might also be regarded as underachievers. There’s no surprise in seeing LeBron James among the “chosen ones” despite missing a chunk of games and playing next to Kevin Love and Kyrie Irving, who have seen their roles reduced (and for good reason) to make this ambitious project work. This will obviously change but it serves as a strong indication of which teams succeed because they’re built the right way and playing correctly, and where the coaches seem to be giving in to the superstar trend, and let everything fall on the shoulders of just one guy. It’s usually not the best way to achieve success in the NBA, as the records of the Warriors and Hawks suggest, not forgetting about the defending NBA champions, paving the way for this kind of “school of thought”.